At the peak of the fair season all across Europe, Mascus, the first truly Pan European on-line market place for used construction machinery, used agriculture equipment , material handling, forestry, groundscare and transport vehicles reports various cooperation with fairs from Russia and the CIS countries. From the beginning of the current year, the number of the fairs Mascus affiliates with in Russia and the CIS countries has been constantly growing. "We have noticed an increasing interest by Russian, Belarusian, Ukrainian and Kazakhstani fairs to advertise on our website. During the past months, we have been approached by various fair organizers, which have been interested in cooperating with us and promoting their events on Mascus sites." comments Mascus Marketing / Internationalization Director Tomasz Odrobinski. Currently, Mascus cooperates, with more than 20 fairs from Russia and the CIS countries, our of which important and well-known fairs like: Trans Russia, a transportation and construction fair; AvtoSib, a transportation fair in Siberia; Rusbuld fairs, which consists of altogether nine events in different parts of Russia, CEMS - a Russian construction fair; Ural Trans, a commercial vehicles fair and many others. Mascus also collaborates with Kazcomak and Ancomak, construction fairs in Kazakhstan and Turkey. "Mascus provides fairs with excellent opportunity to reach the right target auditory." explains Mr. Odrobinski, when addressed about the interest in cooperating with Mascus. "We have more than 1 400 customers from all across Europe and the world and they are potential exhibitors to all that fairs. And not to mention the constantly increasing number of visitors Mascus has- up to 400 000 monthly. It gives Fairs an excellent method to get a massive international profile ", he adds. Due to the increasing interest by various fair organisers to promote their events on Mascus, the website has planned to enrich its content and add a special 'fairs partners' section, where cooperation event organisers from Europe and worldwide can gain even extra visibility. "We think that this is a very good opportunity for fairs in other countries to advertise with us. Mascus always provides the best international exposure ." 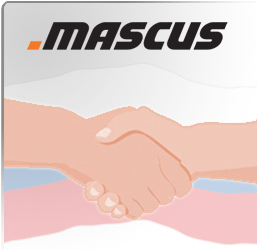 Read more about the fair cooperation opportunities with Mascus. Mascus - Is an electronic marketplace for used farming equipment and agriculture equipment, forklifts, construction, forestry, groundscare equipment and transportation vehicles. Mascus makes trading in used machinery and equipment quicker and more efficient by collecting in one place information about the supply and the demand. All dealers, producers and end users are welcome to offer their used machines and equipment for sale via the marketplace.